Whether you are vegan, veg-curious or just trying to eat a healthier diet, Nava Atlas‘ newest title, Plant Power: Transform Your Kitchen, Plate, and Life with More Than 150 Fresh and Flavorful Vegan Recipes, is a great resource. Packed with more than 150 recipes, Plant Power not only shows you how to make great plant-based dishes with an array of vegetables, legumes and fruit, but also how to shop and stock your pantry and refrigerator, as well as plan meals throughout the week.I first tried Nava’s cream of broccoli soup, which is made by blending white beans with broccoli, peas and dill, and balanced out perfectly with a touch of lemon juice. This vibrantly green soup is easy to make in less than 30 minutes and leftovers heat up nicely the next day. See the recipe below to make Nava’s soup for yourself and, if you are hungry for more, the kind folks over at HarperOne are offering a free copy of Nava’s book through this post. The winner of this giveaway is Johanna, congrats! For a chance to win a copy of this gorgeous hardcover cookbook with tons of interior photography shot by Hannah Kaminsky, just leave a comment below that includes your favorite go-to plant-based dish. I’ll randomly draw a winner on November 25. Please leave your email or some way to contact you in your comment in case you are drawn as the winner. Shipping is limited to US and Canada only. Good luck! Recipe from Plant Power: Transform Your Kitchen, Plate, and Life with More Than 150 Fresh and Flavorful Vegan Recipes by Nava Atlas. ©2014, published by HarperOne, reprinted by permission. 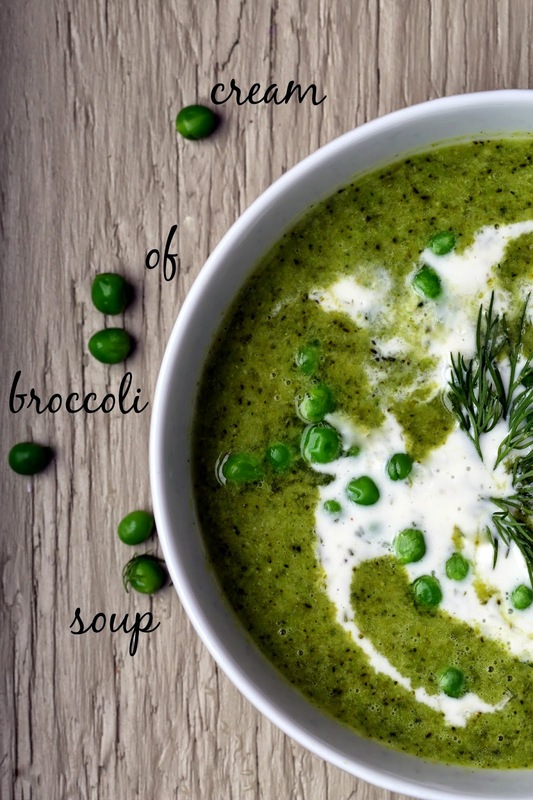 A longtime favorite in our family of broccoli enthusiasts, this soup gets a thick, creamy base from pureed white beans or tofu. The addition of green peas at the end of cooking time brightens the color and heightens the flavor of the soup. This is great served with many kinds of wraps or sandwiches, or with a colorful main dish salad such as Taco Salad. Add the broth and broccoli. Bring to a simmer, then cover and simmer gently until the broccoli is tender but not overcooked, about 8 to 10 minutes. Add the beans or tofu and half the green peas. Continue to cook just until everything is nicely heated through. Such a beautiful broccoli soup have I never seen! Sounds delicious – would love to win a copy of the book. My go-to plant-based meals are polenta with tomato sauce, or a quick lentil soup! I can be reached via Twitter at @ 1SexyVeganDiva..
My favorite go-to dishes are the types that use up all the bits of leftover product in my fridge, like stir-fried veggies with a simple peanut sauce over noodles, or tomato-y quinoa with veggies and olives. Quick and dirty Cauliflower Mac Sauce (adapted from Fat Free Vegan) served over Spaghetti Squash. Or maybe it's Eggplant Misir Wot. Don't make me choose! Beautiful photography and equally excellent dishes too! I'd love to win this book. One of my favorites is miso-fermented "fish sticks" with oven roasted potatoes, tartar sauce and coleslaw. My favorite go-to? Kale saute with either beans, veg meat alternative, grains, or potatoes! Yum! Mj1584@yahoo.com! My go-to favorite is roasted cauliflower with breaded tofu and pesto sauce. Such a combination of comfort foods! Veg mac and cheese, yum. The book looks awesome. Lentil Walnut loaf or veggie bolognese with ground seitan! I would LOVE to win this cookbook, it looks wonderful! so hard to pick one, probably spabettie lasagna! My favorite go to is a quick spicy peanut kale with soba noodles or the crock of beans we make every week – so many possibilities. I just love Vegan cooking! I will try this recipe for sure. My favorite soup is kabocha squash and spinach soup. This soup looks so delicious! My favorite easy dish is garbanzo flour rosemary farinata…I can eat it plain, or make "pizza" with it or have it for breakfast. Yum!! My favourite go-to plants-based meal is a bowl – some roasted vegetables, some steamed greens, a bit of grain, maybe some marinated and baked tofu and a delicious sauce. Making this soup soon! My favorite vegan meal is curried quinoa, chickpeas, and almonds topped with celery and mango chutney. My fave go-to is brown rice with a green veggie, srirarcha, tamari and nooch! My favorite plant-based quick dish is tomato soup. That broccoli soup looks wonderful. We have several go-to dishes, the easiest being pasta with marinara and whatever else we feel like stirring in, kalamata olives, fresh basil, faux parmesan, you name it. Our very fav is White bean, Kale & Sausage Soup/Stew I found many years ago in Cooking Light magazine. The recipe was not vegan (nor was I at the time), but all I had to do was substitute awesome Field Roast Sausage. Everyone, including all meat-eating friends that have had it, LOVE it! This recipe looks so beautiful but I have a question about the milk. The recipe calls for "rice milk or other non-dairy milk," but I've worked with rice milk enough to know that there's no way it would look like this photo if you used rice milk, as rice milk is so watery. The only "milk" I know of that would give that creamy looking, pure white, thick look when drizzled over the soup is coconut milk or maybe a processed creamer or some sort. Can you tell me what you used for the non-dairy milk? Thanks! I blended it with a little extra vegan sour cream I had to provide the contrast. Roasted veggies. Gotta love 'em. ali.seiter@gmail.com. Hmmm, tough question, but I would have to say that fried tempeh with veggies might be my go-to plant-based meal. My go-toe are zucchini noodles with pesto or cashew cheeze sauce in the summer and in the winter, baked sweet potato wedges with cinnamon and paprika and sometimes with guacamole or other chunky sauce for dipping. Simple and delicious! My go-to plant based food is vegetable stew made with cauliflower, tomatoes, green peas, and potatoes, cooked with onions, ginger, garlic, and cilantro. I eat the stew with rice. In college, my go-to was a stir-fry. It was just so easy, I didn't have to think about it, and it was cheap (above all else!). Nowadays I'd say my "go-to" is soup as a general category because I make a huge batch on Sunday, portion it out into Mason jars, and it's lunch for the week. It probably doesn't count as a "go-to," though, since I make a point to try a new soup each week. I think if I am in a jam I always make stir fry dishes with black bean paste. It makes a salty and complex flavor, and it is a great way to use up whichever veggies are in season. My favorite go-to meal is stir fry. I make a delicious sauce and sometimes I don't even bother serving it over rice. The veggies and sauce are wonderful 🙂 I'd love to win Nava's book! Vegan4lyfe@comcast.net. My favorite plant-based dish is pumpkin and bean chili – love it! My husband and I made this soup and we cannot rave about it enough! So delicious and even more so the next day! Had to thank you. I am so happy to have discovered your blog early in my Veganism. Everything I have made of yours is also truly delicious. And I have a nice collection of Vegan cookbooks thanks to you. Thank you, thankful, and Happy Thanksgiving to you and yours. So happy you liked! Nava's recipe is great. Thanks for your kind words about the blog and am thrilled that it's been useful to you! I hope you have a great Thanksgiving as well!